Yesterday I sent out a quick email in anticipation of a new design resources marketplace from Design Cuts. The marketplace is now live and it’s looking fantastic! It’s already filled with some of the best resources around and there’s plenty more to be added over the coming months. The focus on quality over quantity makes it the place to go to quickly find the best assets for your projects, without having to tediously search through hundreds of unsuitable products. To celebrate the launch, I’m collaborating with the Design Cuts team to offer Spoon Graphics readers some great prizes. Do you fancy getting your hands on a lifetime Access All Areas membership, hundreds of dollars of Design Cuts gift vouchers, or the star prize of a professional grade Wacom Graphics Tablet? Read on to find out how to add your name to the prize draw. The Design Cuts Marketplace is Now Live! Finding the perfect design resources for your projects can be overwhelming with all the current marketplaces being packed full of thousands of items. The new Design Cuts marketplace eliminates your search time by selecting only the best quality items from the most talented creators who are renowned for their style in each genre. Let’s say you need to produce a realistic gold effect. You could spend hours sifting through endless similar-looking products, or you can head to the Design Cuts Marketplace and instantly find Instaglam by Creators Couture, which is the leading gold/glitz pack on the market. No more confusion, simply the best possible product for your needs. 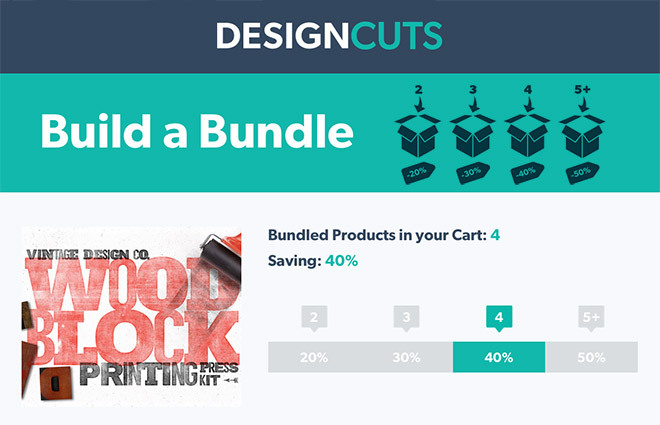 Design Cuts have a track record of collating only the very best products in their design bundles and slashing the price with massive discounts, which myself and many of my readers have benefited from over recent years. The second game changing feature of their new marketplace is the ability to build your own bundle of the resources you want. Add your favourite items from the already curated selection of the best products to build your own unique design bundle and benefit from an increasing discount of up to 50%, something you can’t get anywhere else! Build your own bundle to win some prizes! I think you’ll agree these are some great prizes up for grabs. The Wacom Intuos Pro Medium graphics tablet is a serious piece of kit which can transform your illustration abilities. The medium size is the most popular model, which provides ample work area while fitting neatly on your desk and in your laptop bag. It’s totally wireless, and features multi-touch gesture support, making it ideal for all types of image editing, graphic design, and art interests. The Design Cuts gift vouchers can be redeemed on any items within the new marketplace, or used to grab yourself one of the upcoming bundles completely free! Simply redeem the code during checkout to cash in the credit. All winners will also receive a lifetime Access All Areas membership here on Spoon Graphics, which immediately provides you with 100s of premium resources which grows every week as new items are added. Entering the prize draw is easy! Simply head over to the new Design Cuts marketplace and have a browse through the selection of products currently available. Pick out your top 5 products that you would choose for your dream bundle, then list them in a comment on this post. The 5 winners will be drawn at random in 7 days time (Thursday 25th February at 12pm GMT), so everyone has an equal chance. Remember to use your full name and a valid email address in your comment so we can contact you! Congratulations to all the prize winners Dave, Abel, Dan, Danielle and the star prize winner Simon! I hope your free goodies come in handy. 383 Comments submitted Add yours! Wowzas! I’m just checking in on this post and I’m blown away by the number of comment entries already. Good luck to everyone! I’ll be periodically checking my pending comments list to approve any that might have been caught in the spam net, so don’t worry if yours doesn’t show up straight away. Absolutely love these packs, wonderful idea for the marketplace too! Good luck to everyone entering! Not tried yet but instant in love. A little bit of everything. Some I just bought. LOL I like versatile kits which allow me to mix and match and combine to create different styles for different clients. I love text, type, font, and type effects. I just cant help myself!! some really great choices, i think I will need to load up on the AI brushes for my illustration work. I love the concept of the Design Cuts market place! There are some fantastic resources there already. So many great options! I love the focused direction they are going with their products. Design Cut is now in my bookmarks! Super cool resources. Thanks! I’d go for the following – I have purchased so many bundles it was hard to find resources i didn’t already have!! 1. Aqua type vector watercolor effects by vintage design co.
Great website for any Graphic Designer! Loving building your own bundles! aka Jackie Wyant :-) Cheers! Great Site! Thank you for all the amazing tutorials and tips! Great promotion Chris! I’ve already bought two packs from Design Cuts and they’re great! Between the tutorials, resources and tips this is one of the most useful websites that I could dream of. Thank you for all the help you provide to self-thaught designers, I could never afford courses and yet I’ve been improving so much! Very excited about the new DC marketplace! I wish you well in your new venture. 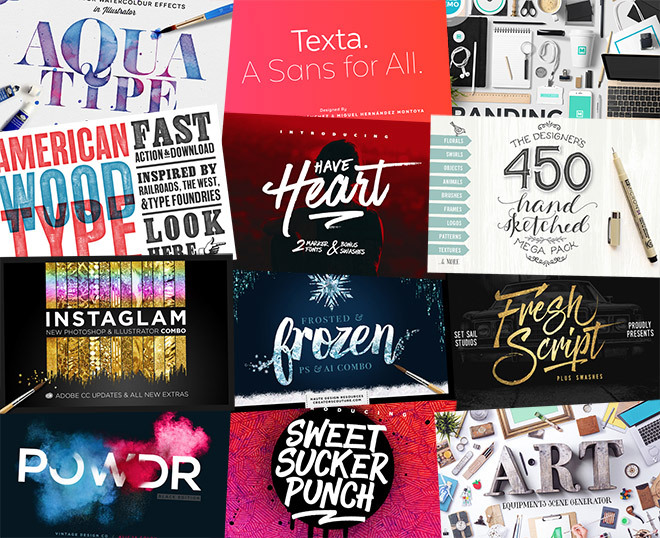 Here are my top 5 I would choose for bundles: Aqua Type, Trend Rough Font Family, TexturePress, iMockup Super Pack, and the WoodBlock Printing Press Kit. I love Spoon Graphics free tuts and would love to have full access. Also have appreciated and purchased many Design Cuts deals! Would love a Wacom for sure! Forgot to put my full name. I love your tutorials and would love to have all access – thanks for all your hard work! These are my favorites. I can think of a number of projects these would be perfect for! This would make a great font package. Great collection to add texture to my designs! Top 5 of many many more!! Amazing new site and giveaway! Here are my top 5! 2. Trend Rough Font Family. 3. Art Equipment Scene Generator V4	Iso. Cannot say enough how much I love the goodies that are offered on this site!! Primarily as a photographer, I tend to shy away from the tools of the graphic designer. However, the creative toolkits offered through Design Cuts is just what I need to bring some retro “warmth” to my images. 1. Inkwell – Instant Ink Effects / Vintage Design Co.
2. Dusty’s Print Shop / Vintage Design Co.
3. Indie Press-Quick Poster Maker / Retro Supply Co.
4. RetroPress-Photoshop Actions / Retro Supply Co.
5. RetroLab-Retro Photo Lab / Retro Supply Co.
First off thank you all so much both spoon graphics and design cuts has been super helpful to the start of our apparel business in finding the tools I need to create the perfect design! Thank you for all of the freebies as well! I don’t know what I would do without either one! Too many to choose but…………. Cool idea by DesignCuts! Always top quality resources on their site. I would say my top 5 items would be these (in no particular order). Anyway, this is a cool giveaway. I could spend way too much money on this site..
4. Antartida Rounded Essential Font Family. Here’s five of my favourites, so hard to narrow down! I am a designer with very specific taste and the products on Design Cuts are very professional. I often find myself in marketplaces where so much is submitted that there is so many poor designs. It discourages me from looking further. Congrats on the launch, and thank you! Very helpful site with time-saving products! 5. Trend Font Family – I’ve always wanted this & never bought it, so thanks guys! I have recently discovered you and DesignCuts (thanks to you) and I love your work and your Style. Thank you both for your Job. Well, that was difficult, so many quality resources to chose from, congratulations! First of all let me tell you that I like your tutorials a lot! They’re really helpful! Keep the amazing work. The idea of buidling your own bundle: quite sweet. AquaType – Vector Watercolor Effects. So excited about this launch! Thank you & good luck everyone! – Texta Narrow Font Family. FlowerType by Vintage Design Co.
Design Cuts is a pretty neat idea for a website and I’ll be purchasing a few of the packages from the bundle for myself. Thanks for posting, it’s a benefit to be in the know at the very least. After 214 comments, I guess this rather like sending a list to the North Pole. “Frosted and Frozen”. Although I’m tempted to just ‘let it go’. AquaType – but having spent a fortune on watercolors, I might do this the old fashioned way simply to justify the money. ExposureX2 – I could do cool and original designs… which would look similar to anyone else working only with the pack. And POWDR. If not only for the fact after 15 minutes, I still didn’t notice there was no ‘E’. 1) Coffee Branding & Packages Mockup by Mockup Zone – a complete set of mockups & collaterals for a coffee shop. 2) Sketched! Hand-drawn Graphic Toolkit by Lisa Glanz – a very organic sketched toolkit. 3) TexturePress – Ink Stamp Effects by Vintage Design Co. – a very simple texture renderer for graphic designs. 4) 100 Grungy Paper and Card Textures (Plus Bonus Tutorial) by Design Cuts – a wide & varied collection of textures with a bonus tutorial! 5) Frosted & Frozen Creative Kit Combo (for Photoshop and Illustrator) by Creators Couture – a unique frozen kit from patterns, backgrounds, & brushes. I love Design Cuts, it has so many amazing and valuable resources! 2-5) Any 4 from Retro Supply Co. Here are my top five! Thank you Chris for this awesome giveaway! So much awesome stuff to choose from! Hard to choose as they are all stunning! Thanks for the great source, most appreciated! 2. FlowerType – by vintage design co. This is a beautiful Wedding bundle. Makes you want to plan a wedding! Hope there’s more to come in this marketplace! I’m into watercolours at the moment! A perfect bundle for gaming poster ads! Thanks for all the amazing content! I have all of these and they’re fantastic. I could keep listing if we weren’t kept to just five products. What a great resource! These are a few I would want. Coffee Branding & Packages Mockup – such a comprehensive bundle, a great addition to a resource library. Thanks ever so much for the opportunity, Chris! there are just so many things that could be done with all of these, the possibilities are almost endless! 5. Santis Font – <—wow! 1. Texta Font Family. 92% Off Launch Special. 2. ExposureX2 – Advanced Photo Effects. 3. Gold 24K Liquid Watercolor Paint Duo (for Photoshop and Illustrator). 4. Build a Bundle: Zero Gravity Stage Generator V2. Looking forward to the new bundles, plenty of nice things i’m sure will be available! So hard to pick. I’m in love with all of the fonts and mock-ups. Designcuts definitely makes it hard to choose! If I had to only pick 5, these are what they’d be. These are great and believe it or not, super helpful in community redevelopment for visioning the possibilities for stakeholders. 1. The All New Essential Branding & Identity Kit for Photoshop & Illustrator! 4. Coffee Branding & Packages Mockup – I love this bundle…some amazing content. Here are my “Build a Bundle” choices, hope I win, Thanks. I love Design Cuts and this new idea! I’d pick Texta Font, Grungy Paper & Card Textures, Subtle Brushes, Madina Script, and the Iso Stationery Mockup Generator. Thank you for always providing us great tips! Ahhh, so many to choose from! My choices. . .
Congrats on the new marketplace! Love the idea of building your own bundle (plus, discounts!). I’ve been a big fan of your work and Design Cuts. Design Cuts will be helping me create some really great projects. I am so excited. Here are my “Build a Bundle” choices, Thank you very much. This giveaway is so awesome! Thanks Chris and Design Cuts! 2.Gold leaf Press by Vintage Design Co.
4. Woodblock Printing Press Kit by Vintage Design CO.
5. Dusty’s Print Shop by Vintage Design CO.
Oops, here’s the full name. I especially love the woodlands watercolor and little spring collection. It’s so whimsical! 1. Wood Block Printing Press Kit – by Vintage Design Co.
2. Exposure X2 – Advanced Photo Effects – by Vintage Design Co.
Hey man, great prizes! I’ve bought a few bundles through Design Cuts before and they are always super quality! 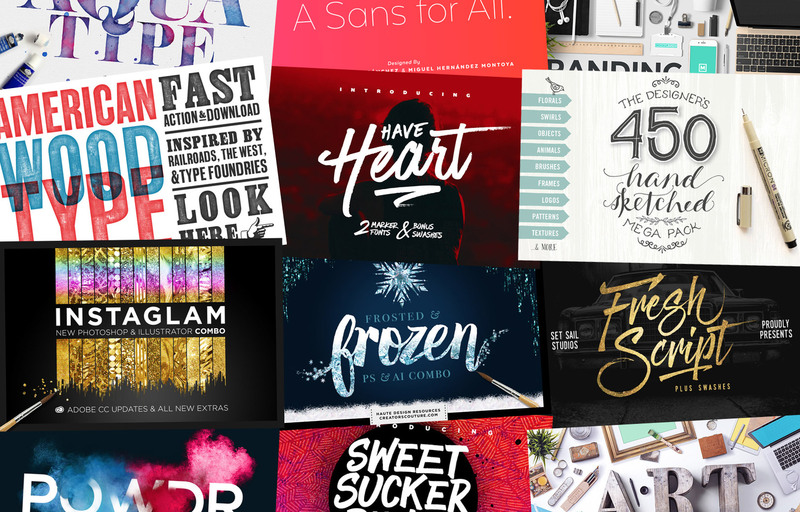 I always got their font bundles, so I’m lacking in some of their other graphic deals! It’s a great new marketplace, I love it! !